Known also as Chinese parsley, Cilantro refers to the parsley-like leaves of the coriander plant. 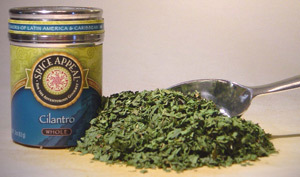 This herb has a deliciously strong aroma and robust flavor with citrus undertones. Adds beauty and flavor to soups, stews, sauces, and chutneys. Delicious with tomatoes or tomatillos in Mexican dishes. An essential ingredient in salsas and guacamole. Goes well with Southeast Asian and Mexican dishes.